It’s been so many months since I last blogged on here. It was due to a packed schedule of events in my life in the last year. I went back to school to get a Masters degree in Literature at the University of Lagos while continuing my work full time. There’s only so many things a man can do at the same time. I have also recently gotten engaged! So Christmas time my fiancee and I have traveled to Akure to be with my parents. On Christmas eve we drove down to Idanre with my brother and two cousins, a town just 30 minutes from Akure to climb the famous hills that were part of the subject of Wole Soyinka’s 1968 volume Idanre and Other Poems. There are 660 steps on the way up the hill. Lacking physical conditioning, we all panted as we climbed except for my brother who ran, jogged and looked so strong climbing. Due to our late arrival, we couldn’t explore so much of the features but it was still a breathtaking view from the top – even it’s my second trip there. It’s always a thing of great beauty to behold the majesty of those hills. I joked to my fiancee that the hills are the droppings of an extinct race of giants. We all had a good laugh. Idanre is a great place to visit for anyone looking for great mountain climbing adventure. There’s lots of history locked away in that town. I just wish that the local people and government would take it upon themselves to promote the resource better. First, we could start with a good restaurant and refreshment shop at the bottom for tourists who need to unwind after a long climb. published by court reporters that had the torment of staying calm while the exchanges were taking place. WITNESS: My name is Susan ! he doesn’t know about it until the next morning? Coffey International Development manages the Construction and Real Estate (GEMS2) component of the joint DFID / World Bank Growth, Employment and Markets in States (GEMS) programme in Nigeria. The core purpose of the position is to work with each all members of the technical team to ensure effective monitoring and evaluation of all aspects of the project delivery. The position holder will work with the Intervention Managers to plan, coordinate, monitor and report progress towards achievements of set targets as outlined in the Programme logframe. The position holder will also be responsible for coordinating collection of primary and secondary data requirements as deemed necessary. He/she will also provide assistance in aggregating the results from the intervention level M&E systems to the level of the overall programme. · Assist in the preparation and design of M&E strategy, systems, templates, and intervention monitoring framework (IMF) for intervention managers. · Prepare project’s M&E internal and external reporting milestones detailing output deliverables, person responsible and associated deadlines. · Work with the Intervention Managers and the Head of Finance and Administration to apportion project inputs/costs across interventions, specific activities and outputs so as to inform the value for money assessment of specific interventions. · Facilitate and manage primary data collection. This could involve: drafting the research requirement (TOR), drafting the research tools, coordinating the recruitment of suitable research firms, managing the selected research firm during the data collection phase and facilitating delivery of data in a timely fashion and to an appropriate quality standard. The aim of the position is to lead and manage a number of programme interventions within skills development and business servies work streams and ensure that it effectively delivers against its terms of reference and budget. · Excellent analytical capabilities, with an ability to think creatively and to communicate ideas effectively with a team. · Project management experience, exposure to technical assistance projects, an ability to bring together sector stakeholders and an understanding of Monitoring and Evaluation principles. Method of Application: Application and CV’s with the job title clearly indicated as the subject of the mail should be sent to; hr@rhizomeng.com. Only shortlisted candidates will be contacted. This slide was presented at a training workshop I participated in this week. 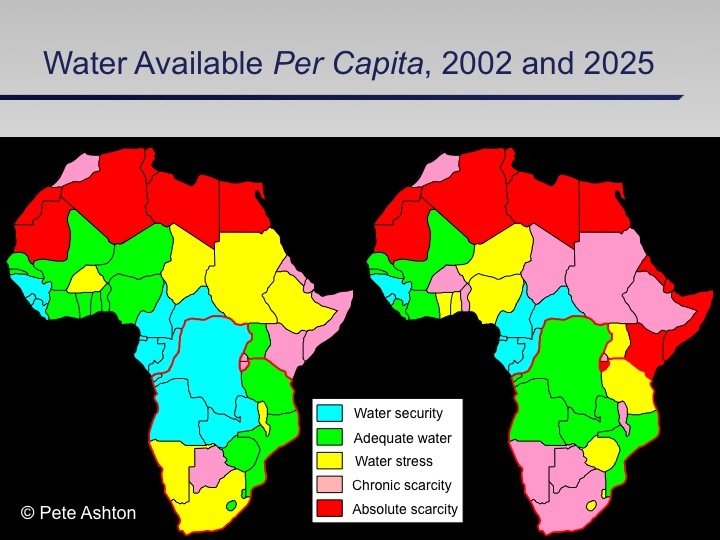 The left hand image of Africa is the surface ‘blue’ water situation in 2002, the right hand side what its likely to look like in just over a decade’s time..
UMass Boston’s Center for Peace, Democracy, and Development (http://www.umb.edu/cpdd/) and Public Conversations Project (PCP: http://www.publicconversations.org/) are pleased to announce a major initiative to support the conflict resolution work of the Interfaith Mediation Centre (IMC) of Kaduna, Nigeria (see http://www.imcnigeria.org/). We seek a Program Manager to assist IMC in coordinating the day-to-day operations of UMass Boston and PCP under the supervision of IMC leadership, and to support IMC operations if requested. The Program Manager will be responsible for delivering services, consulting with staff and serving as primary liaison between IMC and PCP/UMass. The role of the Program Manager is to ensure coherence among the international partners and the sustainability of their support efforts, and to help UMass better understand the daily working and needs of IMC. The Program Manager will be responsible for assisting the PCP Project Director with delivering training in Reflective Structured Dialogue while he is in country, and will continue to monitor and support PCP dialogue initiatives when the PCP Project Director is not in Nigeria. The Program Manager will also work with the UMASS Principal Investigator to oversee UMass Graduate Student teams while they are in Nigeria, including the gathering of monitoring and evaluation data. Lastly, the Program Manager will also work with UMass and PCP in the development of as early warning system, and assist in developing the network in the field. Consequently, the ideal candidate will have several years experience in Reflective Structured Dialogue and other conflict resolution methods, interfaith peacebuilding work, project management skills, and have lived in Africa. Candidates with strengths in several of these areas are encouraged to apply, but conflict resolution experience is required, preferably with a Masters degree or higher in a relevant discipline. Interested candidates please email your CV to both Prof. Darren Kew (darren.kew@umb.edu) and Dave Joseph (djoseph@publicconversations.org) as soon as possible. Further information about the project can also be provided on request. Nigeria’s oldest museum is at Esie in Kwara State (midway between Osogbo and Ilorin). The museum contains over 800 soapstone statues, and has a brand new extension with examples of sculpture and masks from across Nigeria. It is well worth the detour to get to the museum. 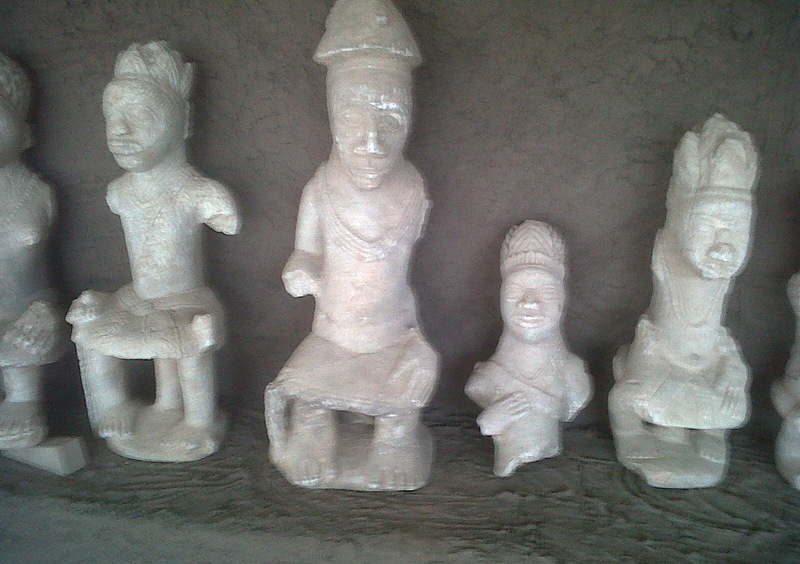 Scholarly research suggests that the figures were made by the Nupe after they sacked Oyo. The figures are therefore dated between the 11th and the 15th centuries. Unfortunately, you are not allowed to take photos in the museum and there are no postcards or books available to buy there, so I had to take the picture below with my phone (hence the poor quality). It is a real pity that photography is not allowed. It keeps the museum as one of Nigeria’s best kept secrets, when it should be thronging with school children finding out about the wonders of their cultural heritage. In the local park, hundreds are out in their finery. Young men wear snazzy Bez-specs; little girls are startled in their wedding cake frocks, while older girls and women wrap translucent shawls over dresses in the northern style. The pony handlers are doing brisk business, two-up per under-nourished horse. The grass smokers loiter contentedly in their usual spot, puffing out sweet herbal clouds. The photographers’ patch is thronged, a little photo printer rolling out future nostalgia inside the scrum. The tensions of the last few days: no fuel, insecurity and the Mpape demolitions, seem to float off, at least for the while. And then, the firmament opens. Damina rain gushes down with pent-up fury. People race for cover under the trees, cram beneath sparse umbrellas and sardine their way inside the keke napep. All scamper except for one or two rollerbladers, who sense that a stage is theirs. One has lights on his blades that sparkle to his rhythm; another twists and turns in arabesques of rain-soaked delight. All of life waits for the downpour to stop. And I trudge home, drenched to my bones. 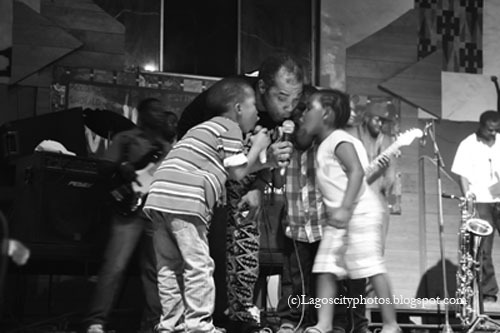 Femi Kuti has been playing at the New Afrika Shrine with his young children. Just like his first son Omorinmade (a.k.a Made) who is now studying classical music in the UK, when he was much younger, Ayomide, Tunmise and his daughter Demilade have been going on stage with their father in recent times. 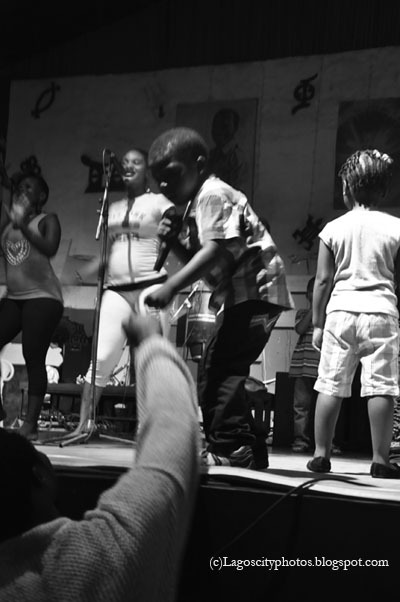 During his Thursday evening rehearsals at the Shrine, the boys mimic every move that their legendary father makes; they sing along with him on make-believe microphones, tap on the keyboard alongside and also pick up imaginary trumpets when he blows. Femi described Ayomide as “just like Fela, too troublesome” in my interview with him last year. He also said Tunmise is learning to be “a rascal” from Ayomide. From what I’ve seen so far, these are two kids who look up to their father so much and are already looking to step into his shoes. The kids are already warming into the celebrity role that their father enjoys as they regularly have to greet revelers and admirers with fist bumps just like their father does. 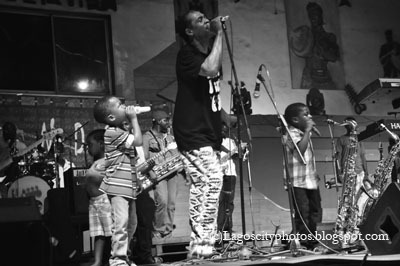 The Kuti family looks assured of another generation of musical torch bearers. 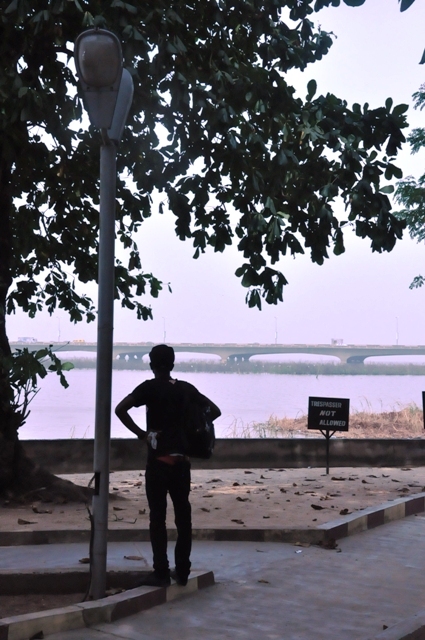 The University of Lagos is bordered by the Lagoon. Along its bank has been built a park where students usually spend time having fun, reading, discussing and plain just admiring the view. 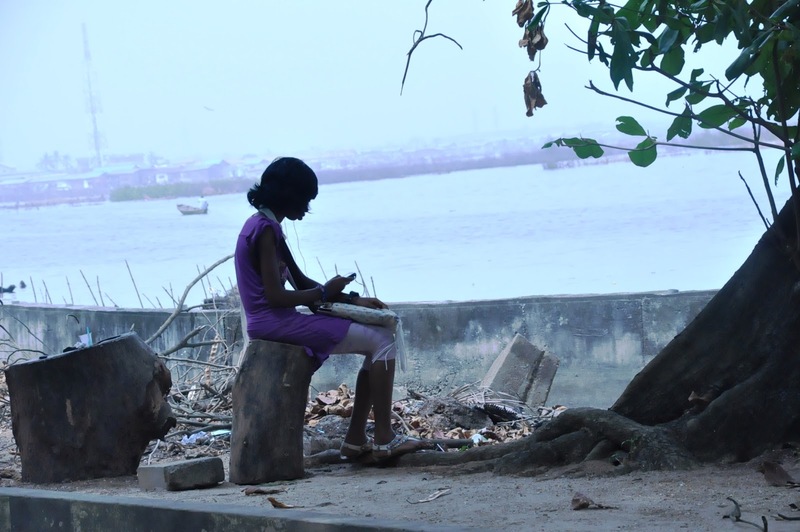 One can watch the Third Mainland Bridge economic rat race from the peaceful lagoon front. I made these images a few weeks ago and only just found them out again to share. The Naming Ceremony, a new play by distinguished Nigerian writer Sefi Atta and directed by Ifeoma Fafunwa, is showing at Nigeria House (next to the Olympics main site) on Sat 28th and Sun 29th July. Femi Kuti: How old are you? FK: You couldn’t have known Fela. LA: Well I knew him even though I didn’t grow up in Lagos. FK: You knew him; you don’t even speak English well. Knew? How did you know him? You met him? Knew means you must have met him, you’re familiar. Knew him in terms of you have heard his album, abi? LA: Before he died. I grew up with my dad playing his songs. FK: So from your dad is how you got to know his music. FK: Even before he died, you were not privileged to even come to Lagos to watch him perform. Patapata[at most] you would have seen him on TV and the footage they have of Fela on TV is when he was old, over 50. LA: No that was Egypt 80 performing in, was it that Egypt show? FK: He never performed in Egypt, either Berlin. LA: There was a big show. It was really the biggest I’ve seen. LA: I can’t remember the city, but it was really big and I saw it on Ondo State TV because I grew up in Akure. FK: You have to tell me because they don’t have much footage of my father when he was young, except you Google him now. There is some footage that people are putting on the internet when he was in his 30s, when he was at his peak. LA: I think he was in his 40s in this video. FK: You still did not “knew” the man. LA: But I’ve read his biographies. FK: It’s like me saying that I know Kwame Nkrumah. I’ve read his book, I’ve read his philosophies. LA: You don’t have to meet someone before you know them. FK: It’s good to still meet, you have met me now; you can tell another generation that you met me. It says a lot in 20 years time when, if I’m still alive or dead, that you have met me than to know or read about me. LA: Stop trying to intimidate me! FK: I’m not trying to intimidate you, I’m trying to make you understand the English that we’re speaking as African people is such a problem and a burden on our lives that if we don’t understand what we’re writing, when a journalist takes his pen and writes that Femi Kuti is mad, it’s a big deal because 100,000 people will read, and they will tell their friends and then Femi does not have the power to counter that story or fight back this journalist, or journalists. 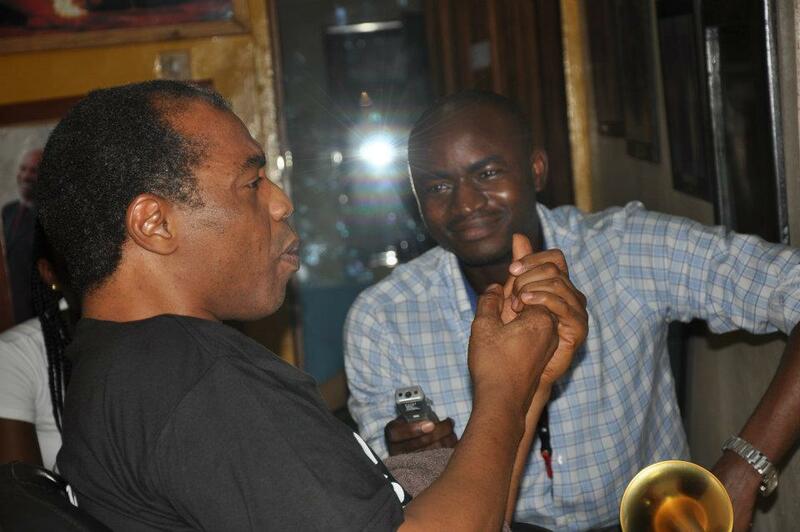 Needless to say, I left that interview a whole lot wiser and became a friend of Femi Kuti. The interview that was scheduled for an hour ran into almost two hours as we exchanged banters. Perhaps like Femi said, I can tell my children that I met him, therefore I know him. However, since I enjoy Fela’s music and identify with some of his messages, having interviewed his sons, read his story and philosophy, I would like to maintain that I KNOW him. Jesus Christ said, blessed are those who have not seen, yet believed. I have researched enough to assume a level of knowledge that many people who met him physically can say about knowing him. I do believe that I know Fela. After all, he’s no longer a man but a concept. An inspiring morning with Jide Bello, talking Nigerian culture. I had no idea the Ife exhibition had moved to the National Museum in Lagos. Great publicity Lagos State! Meanwhile, he showed us some fascinating pictures of a recent trip to Calabar (to witness the filming of Half of a Yellow Sun), including these images of Obong Eyo Honesty IX’s house in Duke Town. The descendants of the old King still live in the house, which features beautiful wood panelling and stained glass windows. To think that former governor Donald Duke wasted all that money on Tinapa, which no one visits except to stay in the hotel, when he could have spent a relatively tiny amount of government money renovating the magnificent old buildings of Calabar and turning them into museums. Calabar’s tourist potential is yet to be untapped. We the undersigned representatives of N-Katalyst, a non-partisan network of individuals from diverse sectors committed to the promotion of Nigerian unity and progressive change, hereby request the establishment of a publicly accessible and representative inquiry into the Dana Air crash of June 3, 2012. The aircraft, a McDonnell Douglas 83 (MD83) with Registration Number 5N-RAM and 153 people on board departed Abuja for Lagos in the afternoon of June 3 but crashed five minutes to landing at Iju-Ishaga, a densely populated neighbourhood in Agege Local Government Area of Lagos. All the 153 passengers on board were reportedly killed as well as unverified number of persons on ground. The fallen aircraft destroyed several buildings and rendered a good number of others uninhabitable by the force of the impact on earth surface. Environmental experts have also reported possible emission of radioactive materials in the neighbourhood. Available information from insider sources and passengers who have flown in the aircraft before the incident suggests that it ought not to have been in service on that day and in fact should have been retired on account of incessant engine faults if the oversight agencies as well as the airline had been steadfast with maintaining aviation safety standards, although the Dana Air disputes these claims. Therefore, an open and accessible public Inquiry will help in ascertaining what really caused the crash and resultant deaths and destruction of property by investigating the immediate and remote causes and bringing to justice any persons or corporates found culpable. 1. September 26, 1992 – A Nigerian Air Force C-130 crashed minutes after taking off from Lagos airport. Around 200 people died. 2. June 25, 1995 – A Harka Airlines Soviet-era Tupolev Tu-134 crashed at Lagos airport, killing 15 people. 3. November 13, 1995 – A Nigeria Airways Boeing 737 crashed on landing in Kaduna, killing nine people. 4. November 7, 1996 – A Boeing 727 operated by Nigeria’s ADC Airlines crashed on its way from Port Harcourt to Lagos. All 142 passengers and nine crew died. 5. May 4, 2002 – A Nigerian EAS Airlines BAC 1-11 crashed in Kano. At least 148 people were killed, 75 on the plane and at least 73 on the ground. 6. October 22, 2005 – A Nigerian Bellview Airlines Boeing 737 airliner crashed shortly after take-off from Lagos. All 111 passengers and six crew were killed. 7. December 10, 2005 – A Nigerian Sosoliso Airlines DC9 from Abuja crashed on landing in Port Harcourt, killing 106 people, half of them schoolchildren on their way home for Christmas. 8. September 17, 2006 – Twelve Nigerian military personnel, mostly high-ranking officers, were killed in a plane crash in Benue state. Six survived. 9. October 29, 2006 – An ADC airliner with 114 passengers on board crashed and burned after take-off from Abuja, killing 96 people. 10. June 3, 2012 – A Dana Air passenger plane carrying 153 people crashed in the Agege suburb of Lagos, killing everyone on board and an unconfirmed number on ground. It is disheartening to note that the standard response of the Government of Nigeria (GON) to all these aforementioned crashes was to set up secretive technical investigation panels whose reports were apparently neither made public nor acted upon. In a way, these technical panels became a tunnel through which successive governments ran away from their responsibility of making Nigerian airspace safe and secure for all stakeholders. Your government is in a historic position to break this vicious cycle of public deceit if it heeds our request to convene a public inquiry into the crash. f. Ascertain the number of people on ground that lost their lives and value of property destroyed at the site of the crash. g. Assess any health and safety at work and environmental protection implications to the residents of the area in which the crash occurred. h. Determine and comment on any broader contributory factors or causes including, management, oversight, maintenance culture and resources. We request that the membership of the panel should be broadly representative including members of non-governmental human rights organizations and Nigerian Bar Association (NBA). This is to ensure transparency and accountability. We look forward to a favourable and timely response to our request in order to take advantage of the mood of the moment; provide some assurance to the bereaved that the death of their loved ones will not go in vain; prevent avoidable air mishaps in future and more importantly ensure that the Nigerian airspace is not only safe but complies with international aviation safety standards. We thank you for your kind consideration and attention to our request. 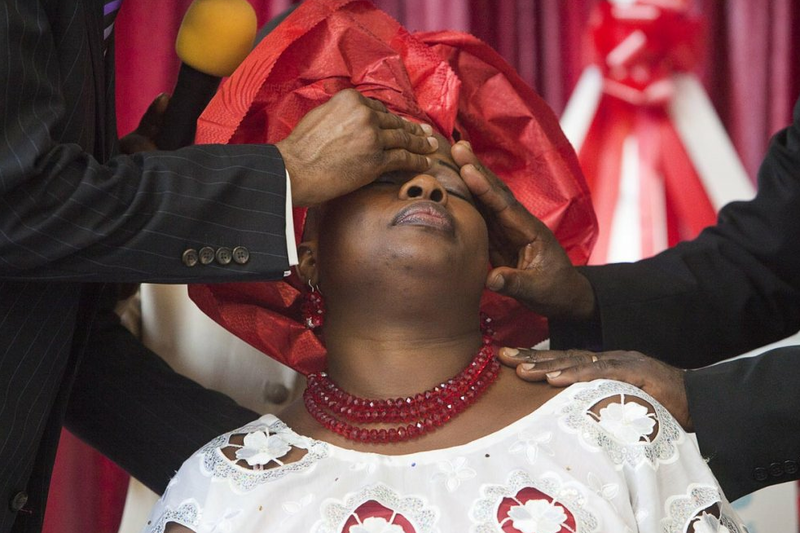 Pentecostal aesthetics photography exhibition coming up in Italy. More here. Inspired by Nsibidi, an African indigenous system of writing that uses symbols, signs and codes to convey concepts, Victor Ekpuk reduces forms to codes and symbols that express the human condition. 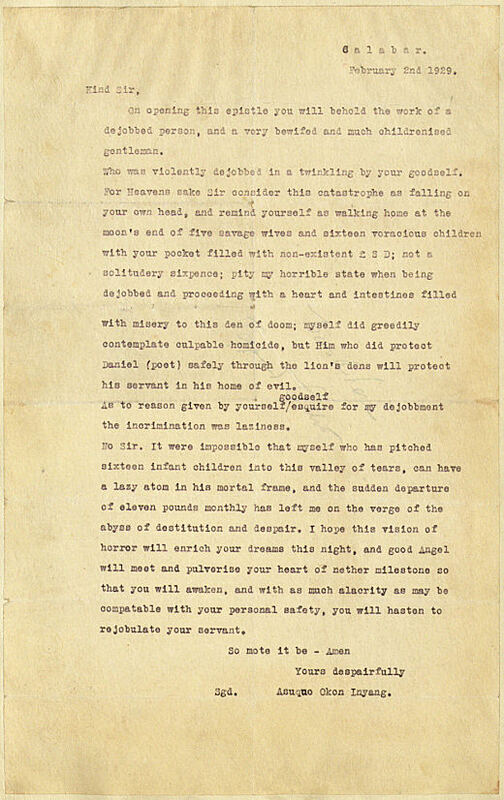 In his compositions, the use of arcane signs and invented pseudo-writings often evoke the idea of writing, where legibility and illegibility are metaphors. 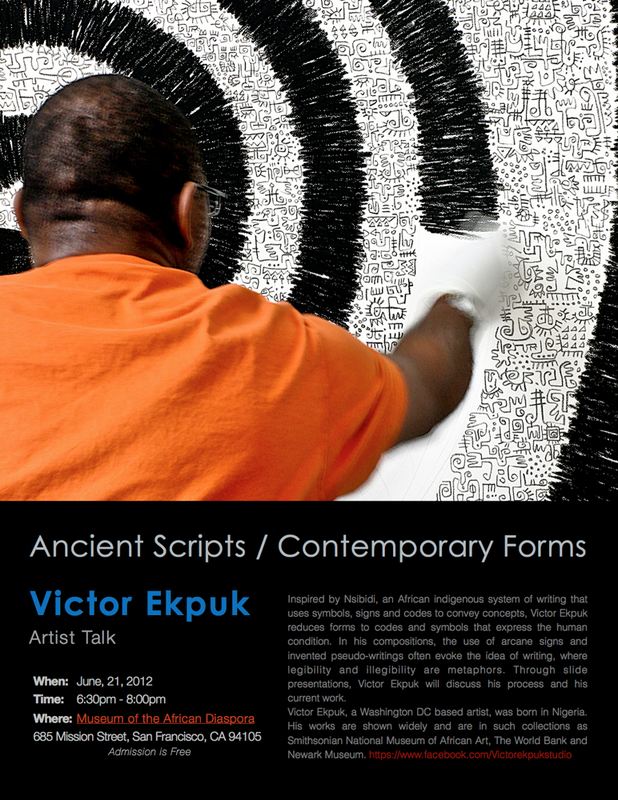 Through slide presentations, Victor Ekpuk will discuss his process and his current work. Victor Ekpuk, a Washington DC based artist, was born in Nigeria. 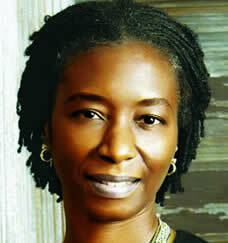 He received a bachelor of Fine Art at the University of Ife, Nigeria in 1989. His works are shown widely and are in such collections as Smithsonian National Museum of African Art, The World Bank and Newark Museum. 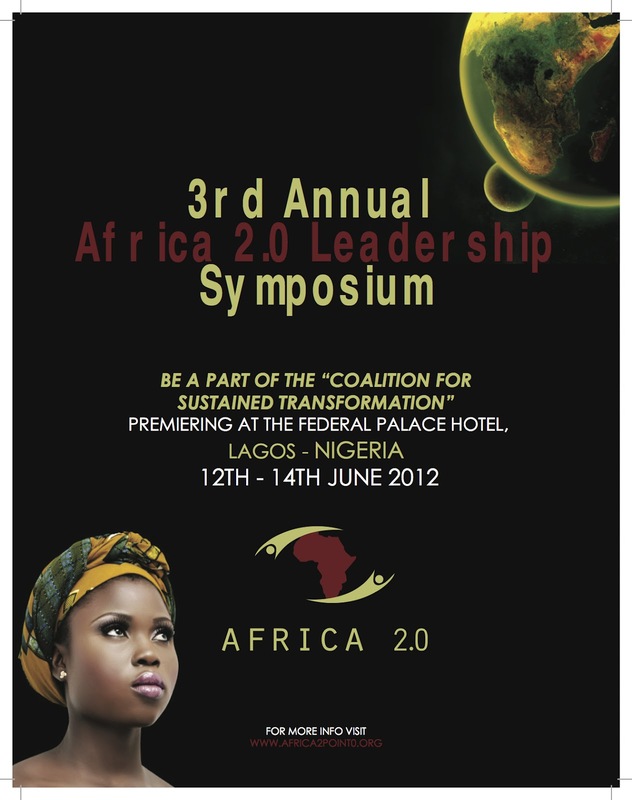 Kindly find attached the Africa 2.0 draft agenda for the 3rd Annual Africa 2.0 Leadership Symposium. Please confirm your attendance of the event by registering here. Once your attendance is confirmed, you will receive an invitation letter which you will need to apply for a Nigerian Visa. You will also receive the events hospitality pack which will detail accommodation and flight details. In a context of multiple initiatives across the continent, Africa 2.0 young emerging leaders (more than 40 African nationalities represented) aim to impulse greater coordination and cross fertilize knowledge/know-how by ?Gathering a Coalition for the sustained Transformation? to Design and Implement Solutions Together. After Ladi Kwali, Danlami was the best modern potter in Nigeria. 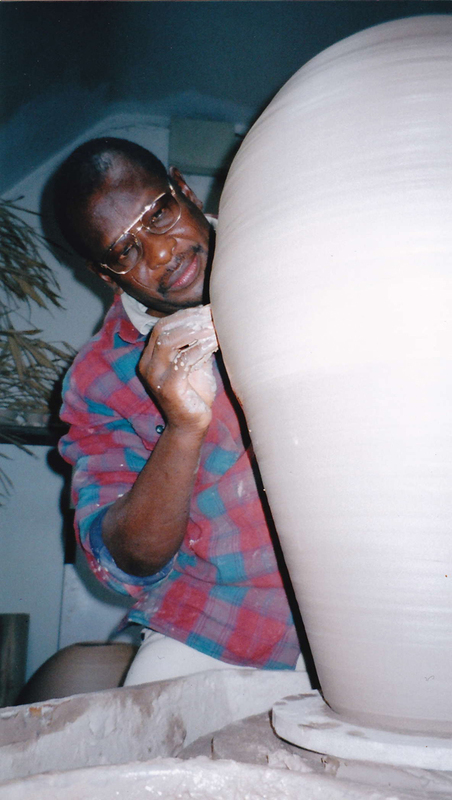 He learned at the Pottery Training Centre set up by Michael Cardew in Abuja. He was good, so I asked Michael if he would take him on at Wenford (Cardew’s own workshop in the UK). He did. He thought Danlami was outstanding and arranged for the pots he made there to have a show at the Commonwealth Institute, London. It was well reviewed in ‘Crafts’ (Another UK journal for Potters). After Wenford, Danlami went to Farnham College to learn about kiln-building. In the Thesis he wrote at the end of his course, he compared the pottery made at the Training Centre with the pots his mother used to buy locally. This thesis was published whole in ‘Pottery Quarterly’. Out of respect for Michael he gave it to him in person. On the train to Cornwall, Michael’s wife Mariel read it and was so moved by it tears ran down her cheeks, charmed by his simple way of writing and the Africanisms which made it so vivid. Michael read it and was silent. A comment made by Danlami in a spirit of humility, not of criticism, devastated Cardew: “too complicated for us” is what Danlami wrote of the Centre. The Training Centre and the fifteen happiest years of Cardews life that he had spent setting it up, were deemed a failure. “Too complicated”, those two words haunted me too and fundamentally changed the way I taught when I returned to Nigeria. By this time, fifteen years after Cardew left, the Abuja training centre was in decline. After a further six years Danlami, having been overseas and now understanding it’s significance, together with Umaru his brother and myself, decided to do something about it. We built a new pottery at Maraba, modelled on the original one at Abuja, hoping to recapture the extraordinary spirit it had while Michael was there. It was successful. Danlami stayed longer than I did and gave it a sound basis which enabled it to expand and last twenty years after he left. To this day there are more good throwers (potters) in Maraba than in the rest of Nigeria. The other things Danlami did there would be of little interest here, except his ‘regiment’ as he called them, – his fifteen children! To spend a day in his compound was a pleasure, the younger ones were beguiling and so well behaved with inquisitive little faces, the adolescents graceful and friendly. Danlami is well remembered in the UK when he was a student. He was young and handsome, a joker, popular with everybody. In Minna, as news of his death spread, crowds filled his compound. People from all walks of life from top civil servants (the Governor sent a representative) to poor potters who – came from Maraba two hundred miles away. He was very well liked and it was a great tribute, but how sad he has gone, he was only 59. What a pity so little of his brush decoration has been seen (and valued). He saw Cardew’s work but his is different. It is so skilful that it is surprising it shows no trace of showmanship, instead it is simple, not the simplicity achieved by minimalism, but by a simplicity of spirit which sings as pure and as natural as a bird’s song. Michael Cardew thought him outstanding and so he was. This obituary was written by Micheal O’Brien for ‘Ceramic Review’, a UK Journal for Potters. My client, School for Startups, is seeking to assemble a local team to support their School for Startups Programme in Nigeria. The project team will include a Programme Director, Programme Coordinator, programme Assistant and 30 Monitors. They will all be based in Nigeria. School for Startups have been invited by Federal Ministry of Finance, Nigeria and UK Department for International Development (DFID) to support The Youth Enterprise with Innovation in Nigeria (You WIN!). The core component of You WIN! is a Business Plan Competition through which 1,200 winners have been selected. The winning entries are a mix of start-ups and existing enterprises that are looking to expand. School for Startups will run a year long programme for the 1,200 Business Plan Competition winners across six geopolitical zones of Nigeria. The programme will include intensive training programme of ‘boot camps’ and e-learning support provided to build business skills. 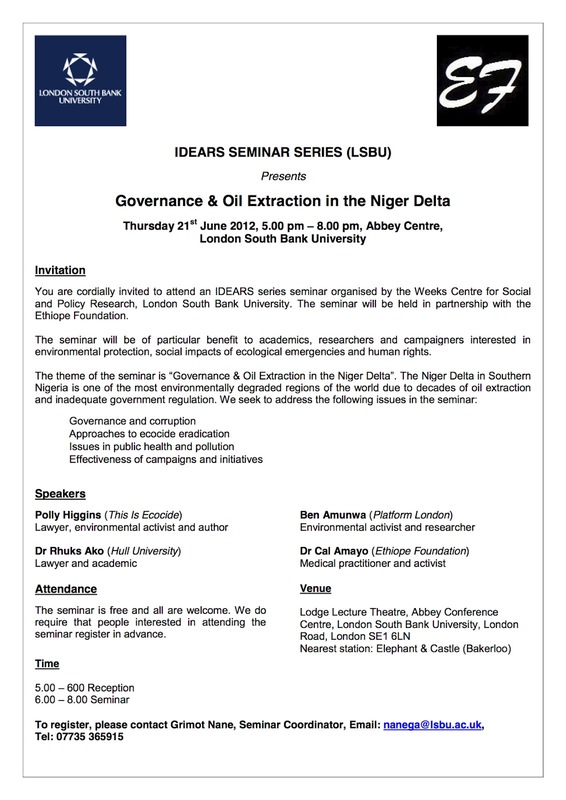 The year long programme will end with an Awards Ceremony in Nigeria. School for Startups is a leading provider of business training for entrepreneurs and small businesses. Since 2008, School for Startups has trained more than 12,000 entrepreneurs in face to face and online classes. For further information about School for Startups and its programmes is attached. I would welcome your support in helping me to identify suitable candidates for the post for Programme Director, Programme Co-ordinator, Programme Assistant and Independent Monitors for the programme. Please find attached brief job description together with project background information. At this stage I would like to gather CV’s of the potential candidates together with their contact details. 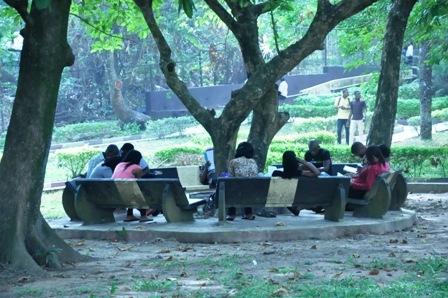 The full list will be reviewed with School for Startups followed by an interview via Skype or face to face in Nigeria. We hope to make the final appointments by the end of May. We are working to a tight schedule. I would appreciate if you can please let me have any suggestions by Monday 7th May. We will review all the candidates’ week of 7th May; select and interview week 14th May and appoint by week 21st May. Like most Nigerians, N-Katalyst, a non partisan network of individuals across different sectors who have deep commitment to the promotion of Nigerian unity and progressive change are shocked at the revelations from the House Committee on Fuel Subsidy. We have evidence before us of the most monumental mega corruption on our nation’s history. Nigerians must rise and stop this massive looting of our resources and punish the culprits. N-Katalysts invites citizens, the international community and the media to a symposium to address the issues and map out a plan of action on the imperative of accountability.